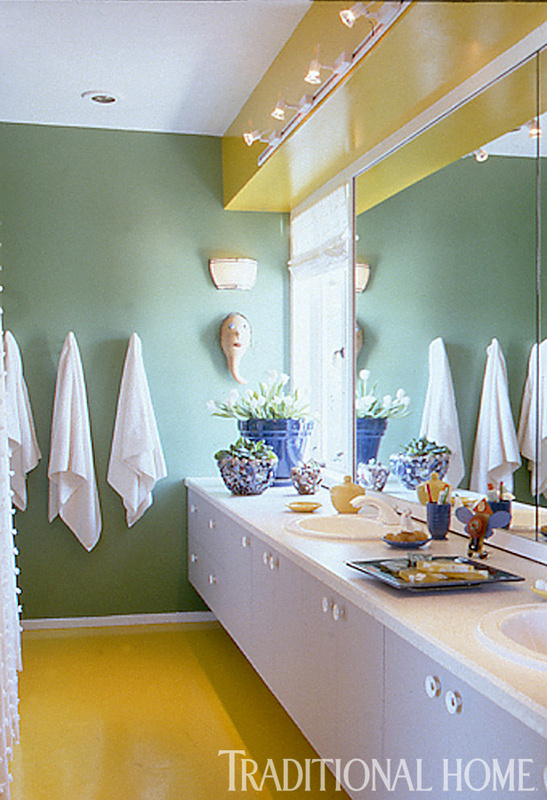 It’s safe to say bathrooms have come a long way since 1989—we certainly enjoyed a few chuckles at some of the over-styled bathrooms of 25 years ago. But luxurious materials coupled with a “less-is-more” design approach have turned this part of the home into an important living space. Bathrooms have evolved into stylish, serene retreats with their custom vanities and spacious closets, soaking tubs and rainhead showers. Here's a look through some of our favorites from the past 25 years. In this waterside home in the Charleston, South Carolina, area, charm and elegance are surpassed only by comfort. 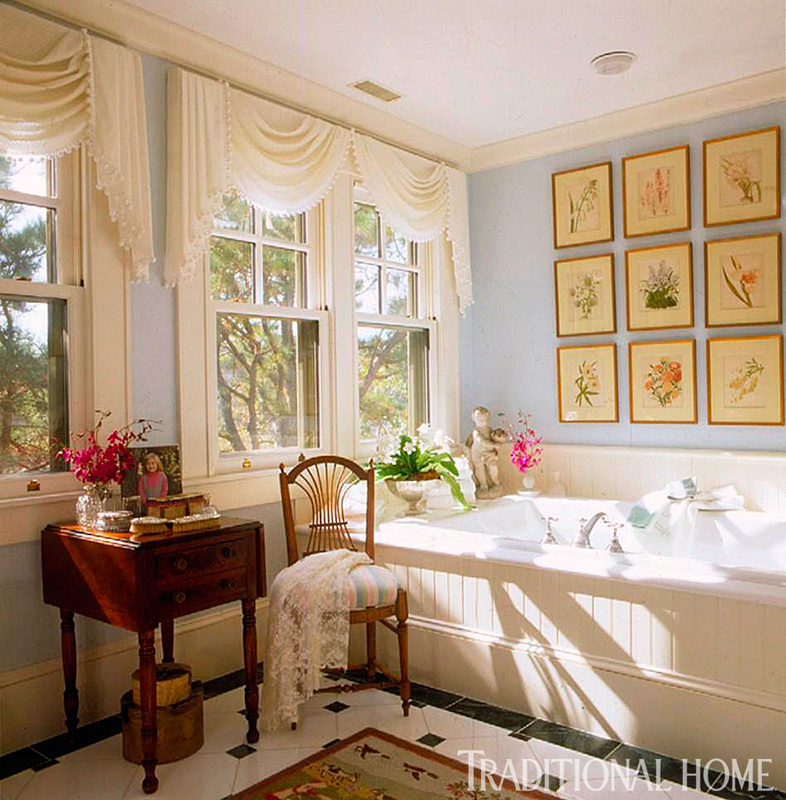 The homeowner's love of white lace is evident in this bath, which accommodates guests and serves as the family’s powder room. Refined touches such as lace curtains, an old chandelier, and beadboard paneling reflect the home’s interior design. In this Cape Cod Victorian home, which is perched on a 60-foot cliff overlooking the Atlantic Ocean, interior colors were chosen to reflect the seaside surroundings. The delightful second-floor bathroom connects to two bedrooms. Airily adorned with crisp seersucker curtains, white floor and wall tiles, violet-strewn wallpaper, and a wonderfully whimsical swan table, the room is every inch a charmer. What started as a tiny gardener’s cottage with a grand view turned into this couple’s dream home on picturesque Marblehead Harbor north of Boston. The harbor helped dictate both the construction and interior design of the home as the owners converted the cottage into a more livable space. “We wanted to bring some of the beautiful elements of the harbor inside—its freshness, bright colors, and eclecticism,” says homeowner and designer Peg Dobroth. 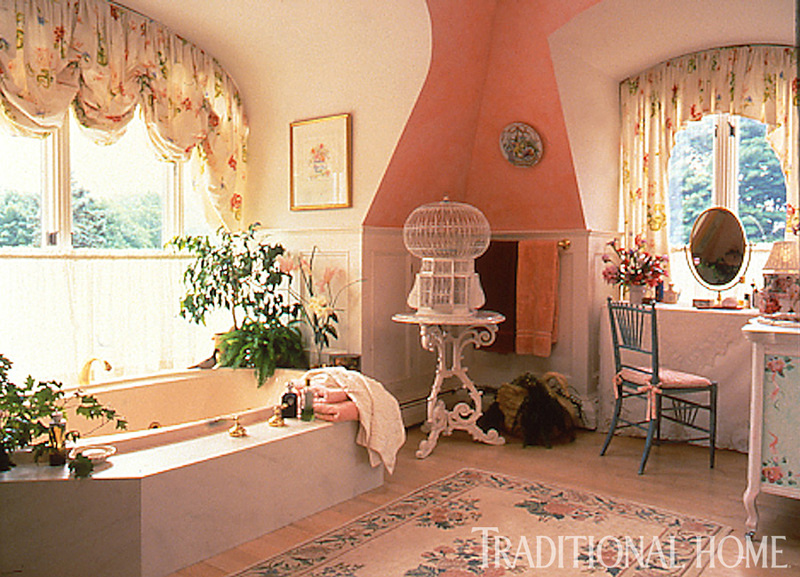 Bright colors pervade the home, even in the master bath, where a sunset pink adorns the walls. Dressing-room details sum up Peg’s gift for giving has-been pieces new reasons for being. Renewed with white linen and lace, a junk-store table became a pretty vanity. A decorative paint job and a Corian sink and top put and old oak chest back to work (far right). The oval tub was dropped into another custom Corian rig: an encasement fabricated on-site. What was once just their summer house on Cape Cod became this family’s year-round home. Heirlooms and other furnishings brought from their Boston home debut in casual context in the master suite. The chair and table in the bathroom, for instance, are both Boston transplants. 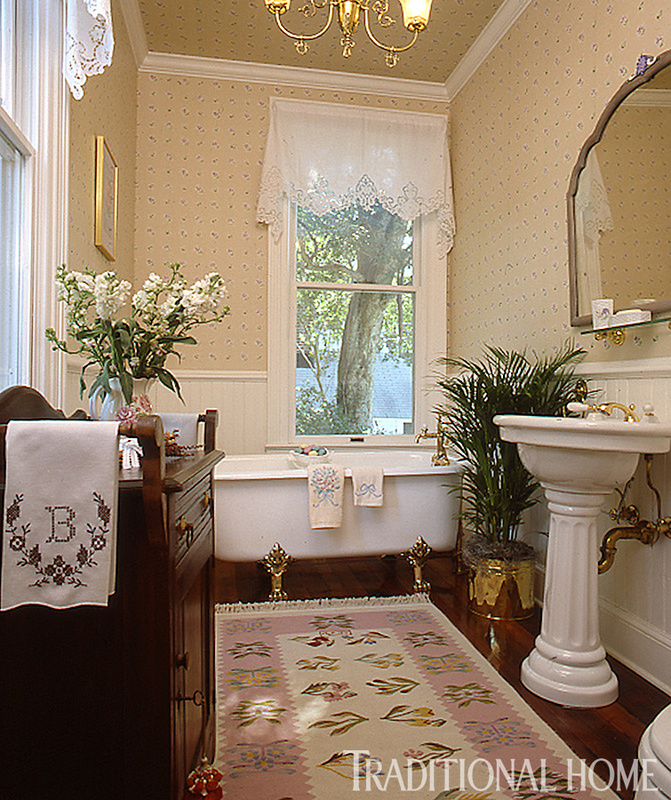 The master bath, with its paneled tub surround, green-and-white marble floor, hand-colored engravings, and wags and jabots fringed with pom-poms, exudes Cape Cod charisma. Blending design elements inspired by country cottages in France, England, and Italy, this Seattle-area home brings a love of things old to its Puget Sound lot. The home features a muted palette splashed with rich reds, subtle pinks, and sunset golds. Soaring ceilings form a light-filled aeire for the master bedroom and bath. The big institutional tub was stripped of its stand and placed directly on the marble-and-terra-cotta floor to set a tone of relaxed informality. The homeowner loves to open the French doors at night and let the sound of the sea wash over the room. In 1995, Traditional Home partnered with Kohler to build a romantic home that would be more than a collection of surfaces and finishes—a home that would be a joyful self-expression of the people who lived there. 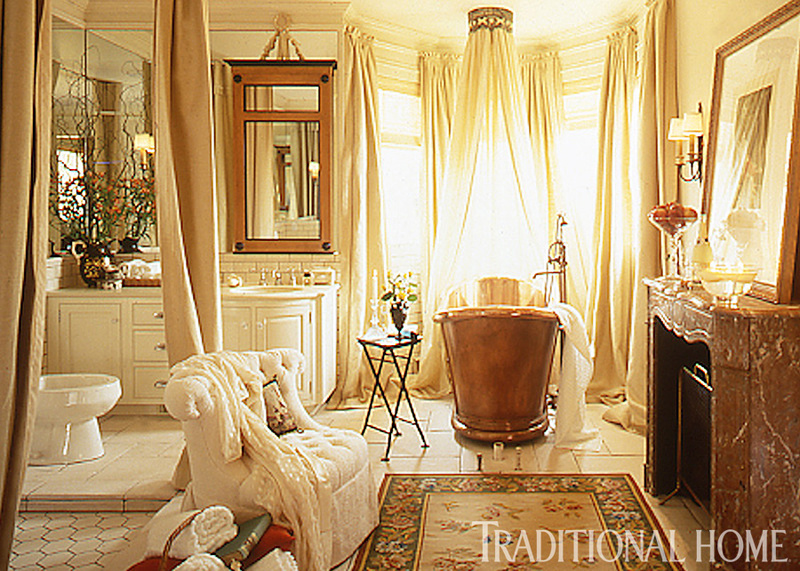 In the master bath, a sensuous copper tub nestled into a bumpout gets a regal and romantic presence from sheer fabric hung from an antique French canopy. 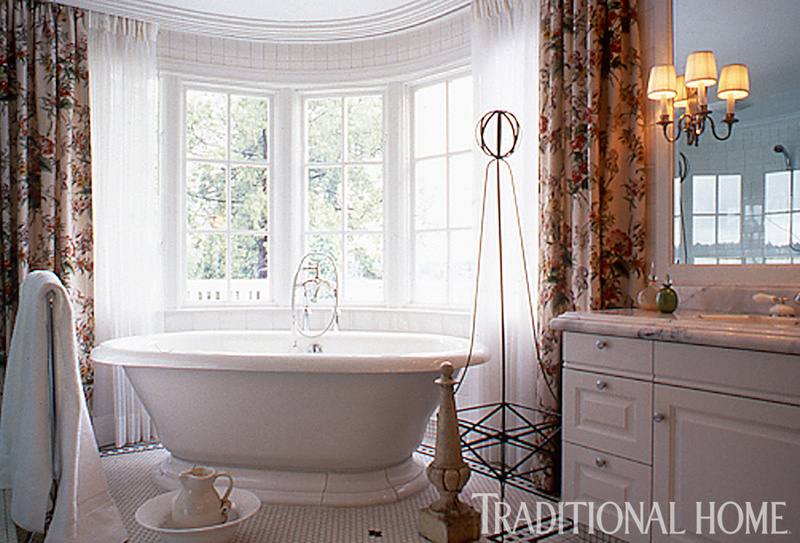 The curvaceous tub is echoed by a custom bow-front vanity. Over the vanity, a neoclassical mirror hangs on a mirrored wall. Small, inexpensive antique sconces lend mood and personality. An antique marble fireplace mantel surrounds a gas fireplace. Behind a terry-cloth-covered tufted chair is a tiled shower area that uses lined fabric curtains rather than glass doors. On the Maine coast, interior designer Mary Douglas Drysdale made a definitive style statement with a tantalizing play of shapes, patterns, and colors in this family beach home designed for fun. 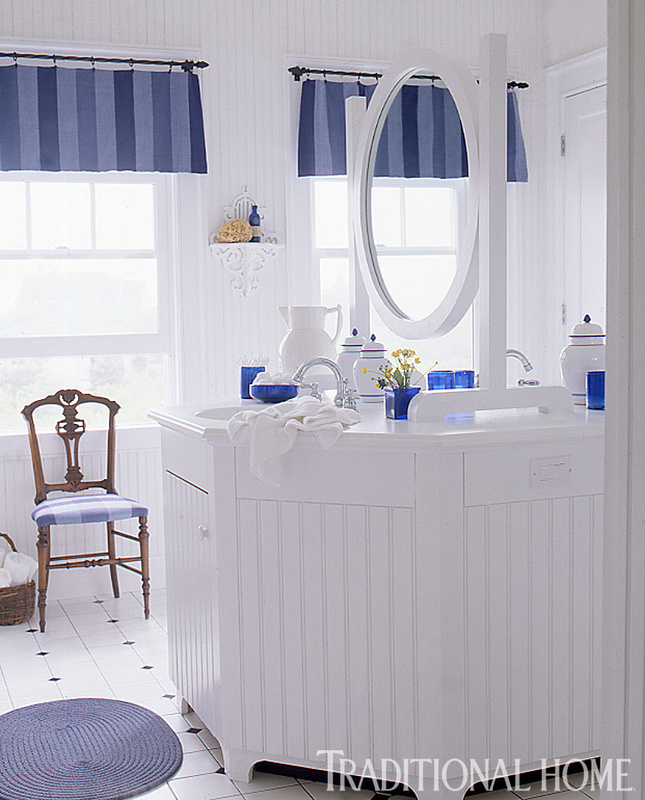 The master bedroom’s all-American color scheme continues in the master bath. Clad in cottagey beadboard, the octagonal, two-sink custom vanity with a two-sided mirror anchors the space. Simple window shades roll up behind deep fabric valances. Not far from Seattle, a bland 1960s suburban Colonial with uninspired additions and little natural light was transformed into a color-drenched home with lovely, livable spaces for a family of six. For the parents of four young children, the master suite suite provides a sweet escape—although the homeowners admit that their children have claimed the elegant, oversized tub in their bathroom for use as a pool. Unglazed ceramic tiles suit interior designer Doug Rasar’s plan for a neutral backdrop. This homeowner called upon Charles Spada to help design her Essex, Connecitcut, home after she saw the sophisticated simplicity of his designs in a local decorator’s showcase. The upstairs of her circa-1840 Federal farmhouse was once a warren of small rooms with low ceilings and narrow hallways, but was converted into the three-room master suite. It took three small rooms and a hall to make the master bath. Gutted to the rafters, the space gradually emerged as an aerie softened by new moldings and French windows overlooking formal gardens at the back of the house. The bathroom features sleek marble counters contrasted with a natural-colored tumbled-marble floor laid in 16-inch squares without grout. When a lot adjoining their Hamptons home came up for sale, a New York couple saw an opportunity to build a tennis court. They also ended up building a 32x32-foot cottage to serve as a guesthouse. The cottage is furnished with a mix of new and antique items, all finished in casual, easy-care materials. Colors are a mix of cool blues, creamy whites, and the warm brown tones of wood. 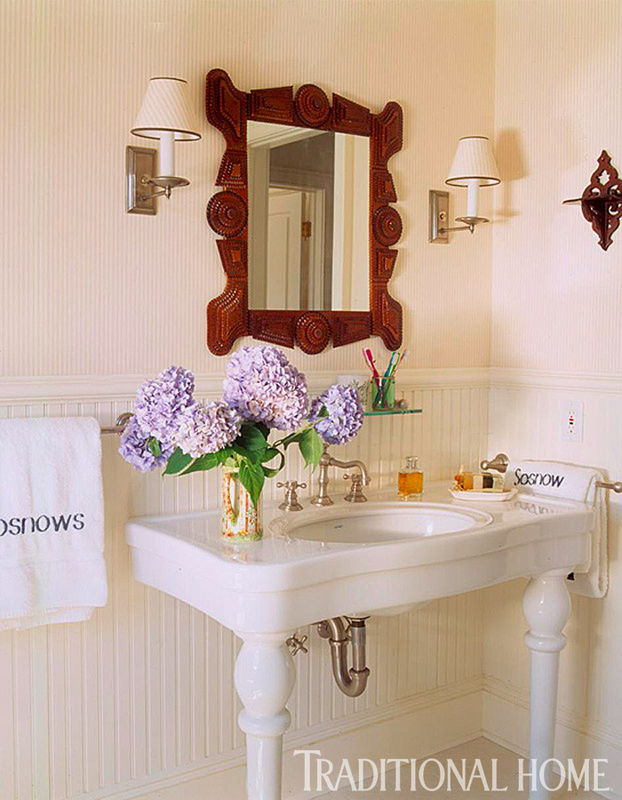 In the guesthouse's only bathroom, a fanciful old tramp-art mirror, a console sink, and sconces set the perfect tone. At the Alexandria Showhouse, interior designer Beverly Broun McClinton was assigned not one, not two, but three bathrooms. 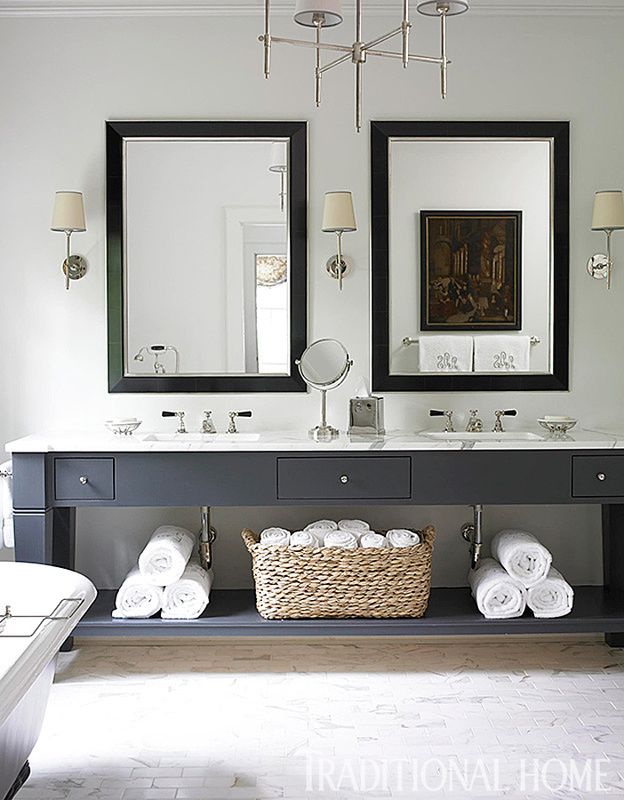 Her main challenge: making the three bathrooms look as if they were created by three different designers while still respecting the overall style of the home—an 1890s farmhouse that was renovated in the 1950s by modernist architect Charles Goodman. In the narrow children’s bathroom, the goal was to do the most possible on a tight budget. Since bright graphic colors seemed a natural for a child’s room, the basic design element—paint—was simple to choose and economical to use. The bright colors are complemented by a countertop that boasts the only real pattern in the room and was thoughtfully placed only 23 inches off the floor—lower than the standard but perfect for children. Its delightful creamy white background is speckled with faint flecks of blue, red, green, and yellow. Our March 2001 issue featured 11 spaces from our Built for Women Showhouse, each crafted by an illustrious designer for one of our celebrity honorees. 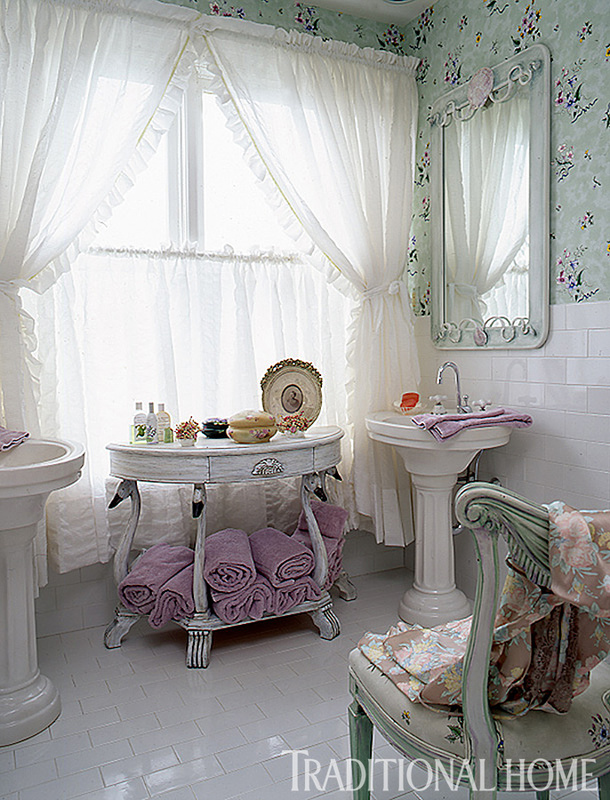 Kitty Hawks designed this lounge-like bathroom on the top floor of the showhouse for honoree Candace Bergen. Hawks delights in imperfections—and will even create them if there aren’t enough. So the mirrors in the “shower room" portion of the space were intentionally roughed up to look old. The untiled portions of the walls are outlined with a light, lyrical stencil, inspired by a detail in a Victorian painting and made to look hand-done. Gorgeous natural surroundings inspired a California couple to build a 2,800-square-foot home on a narrow parcel of land in Montecito. Although new, the home, built just for the couple now that their children are grown, features worn shutters, rustic interiors, and antique finds. 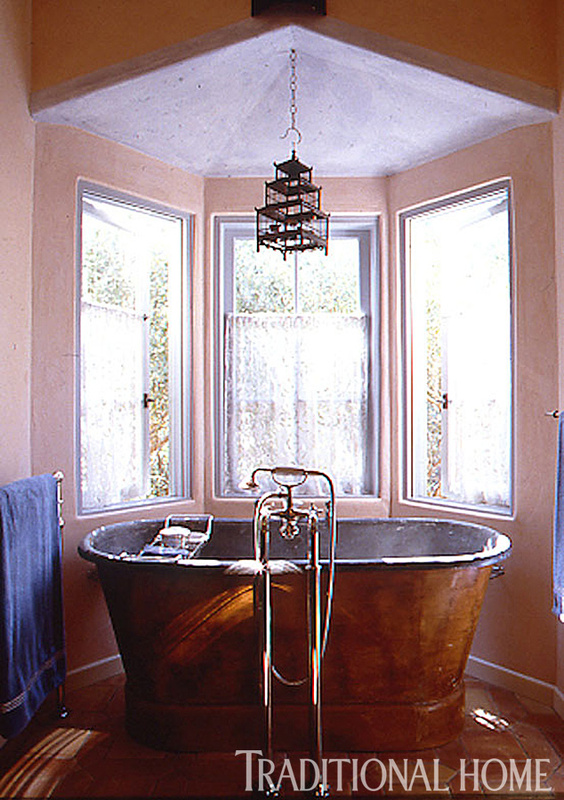 The zinc bathtub in the master bath is a French antique, circa 1860. After 21 years in New York City’s Greenwich Village, these East Coast natives relocated to Los Angeles for a job. “It was very hard to leave,” homeowner Carol says, “so we tried to bring some New York style with us.” Case in point: the old-fashioned look in the master bathroom. To give the bathroom the kind of style the couple had grown to love while living in the city, they covered the floor in tiny black and white porcelain tiles and dressed the room with old-fashioned fixtures and antique furniture instead of built-in cabinets. A river literally runs through this 75-acre ranch about 25 miles from Jackson, Wyoming. With unfettered mountain views, gold-medal trout fishing, and a million and a half acres of Bridger-Teton National Forest next door, the attraction was obvious for an outdoorsman who wanted to build a log home that looked like an old ranch. Interior designer Debra Martinson wanted the interiors of the home to reflect the same peacefulness and rugged beauty as the surroundings. The master bathroom is a study in contrasts. 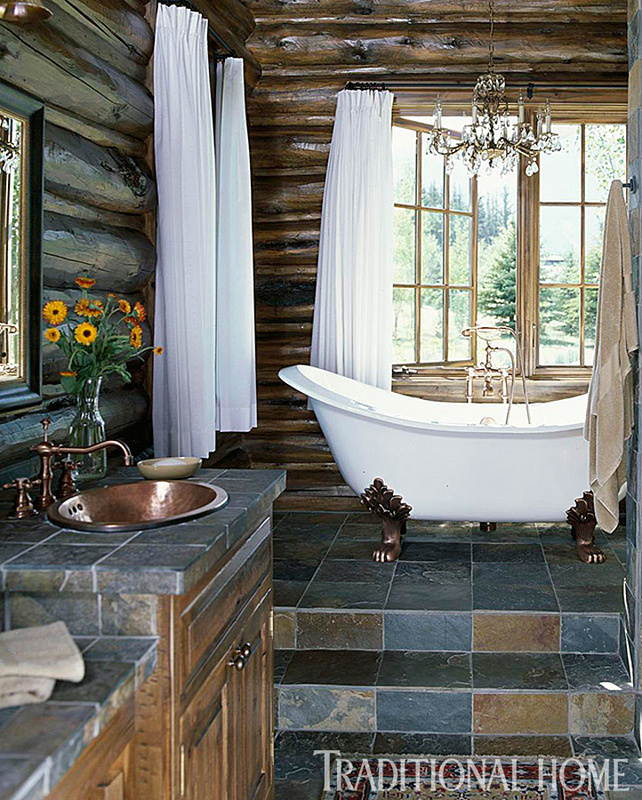 A warm copper sink and fixtures, a sweeping romantic tub with a view, and “petticoat” curtains, as the designer describes them, offset the slate floors and hand-hewn logs. 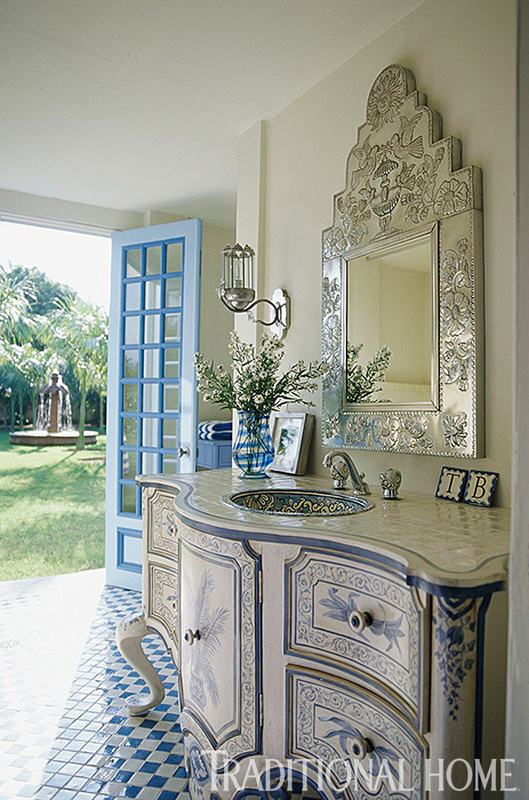 Artist (and friend) Carole Lansdown painted the vanity, inspired by antique Portuguese tiles. Because he believes outdoor living is as important as indoor, Bartlett carries the outdoor themes seamlessly indoors. The white-painted Georgian-style facade of this Pennsylvania home belied an outdated interior full of knickknacks, flowered chintz, and dark mahogany curved with shell motifs and cabriole legs. To update their home, the homeowners called on designer Jeffrey Bilhuber to let the light in, room by room. Where traditional English chintz once reigned, warm neutrals and must-touch texture now hold court. 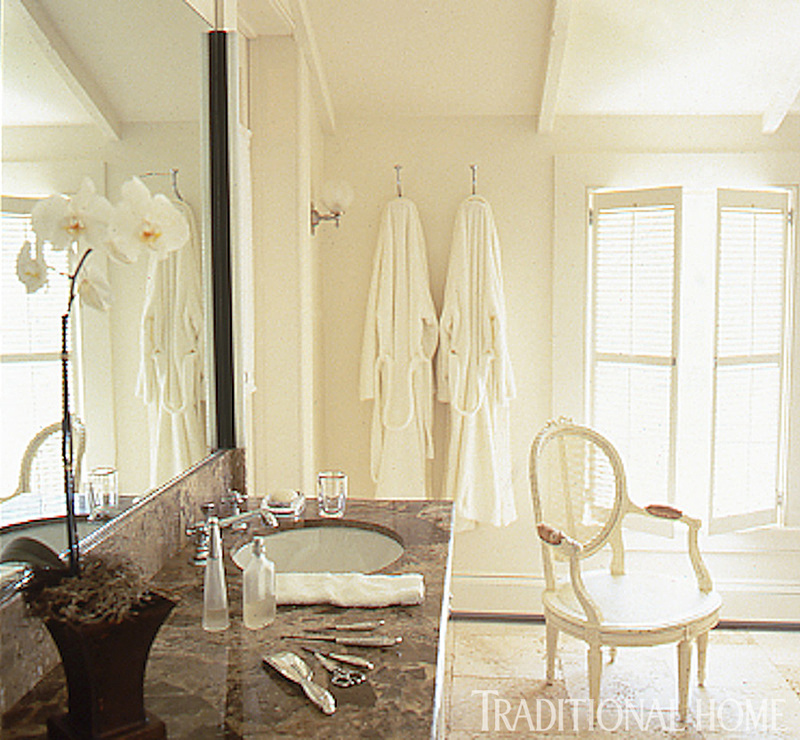 Stonelike walls in the master bath are made of marine-grade plywood painted a linen white. An antique Klismos chair dutifully holds towels near the shower. 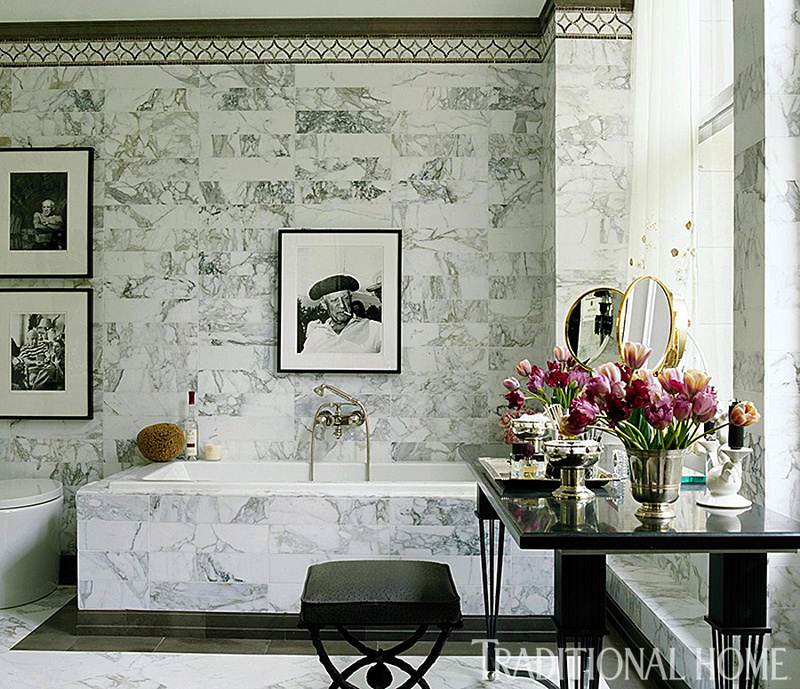 Designer Larry Laslo dazzled at the Kips Bay Boys and Girls Club Showhouse with his master bathroom in black and white. The high-style space started with a blanket of Italian marble laid out in a random pattern over the walls and floor, giving the room a shot of lightning-bolt energy. The minimally framed dressing table and bench add just enough weight without interfering with the sunlight and airiness pouring through the window. The tub, faced with the room’s hallmark marble, melts into the background but is given its own twinkle with chrome faucets. A hatbox-shaped toilet sits beside the tub. Black-and-white images punctuate the wall, which is topped by a mosaic tile border. With a new baby on the way, an expectant couple decided to give their 1950s Santa Monica house a redo—both aesthetic and environmental. Homeowner and eco-conscious designer Laura Forbes Carlin worked with her sister Alison Forbes Houlian on the necessary changes. Questionable existing materials were either cleaned up or replaced with safe, Earth-friendly alternatives. For tile and stone floors like those in the master bath, natural grout sealer was applied. To enhance flow between rooms, mineral-based lime paint was used on most walls in the house. See the rest of this home. A Los Angeles homeowner searching for a bold way to display an impressive art collection found her match in interior designer Windsor Smith. Smith started by staining all the wood floors a very dark walnut. The idea was to give each space a sense of drama that could hold its own against the dramatic proportions and palettes of the art collection. The dark walnut floors continue into the master bath, where their rich stain is repeated on elegant marble-topped vanity cabinets that run parallel to each other. 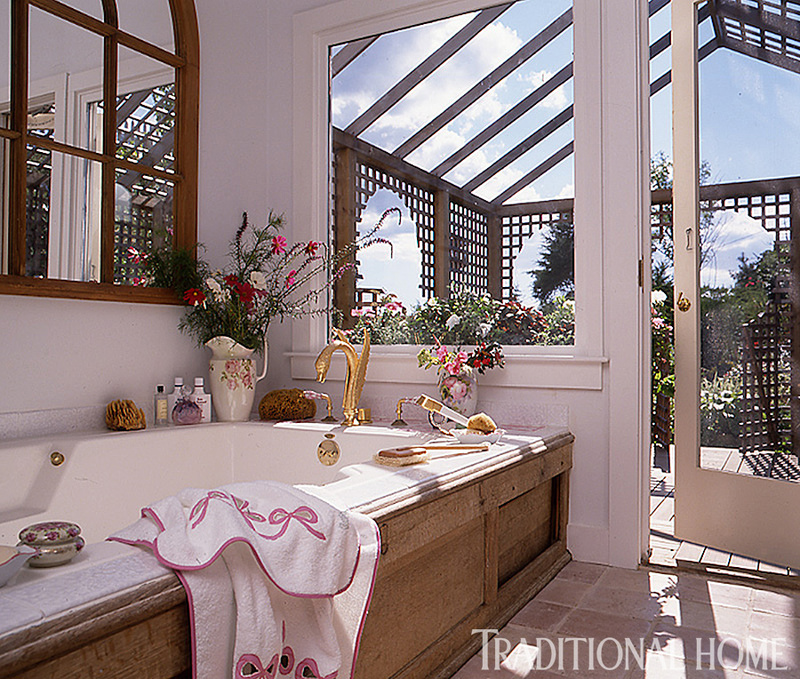 A soaking tub holds court in front of the windows. Atlanta designer Amy Morris designed this home for a couple she knows well—her parents. About 1,500 square feet were added to the home, including a bumpout in the master bath. In the master suite, the existing master bath and closet were reconfigured into a large walk in closet. 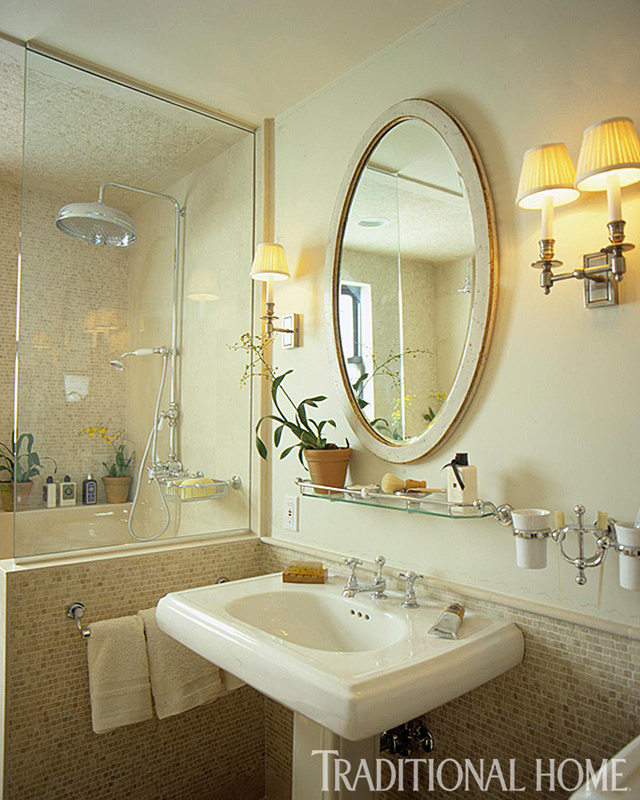 Architect Bradley Heppner designed the double sink vanity with faucets by Lefroy Brooks. The chandelier and sconces are from Circa Lighting. Furniture designer Bob Williams added cool blues and even cooler collections to his updated Georgian Colonial in North Carolina. Upstairs renovations revolved around creating the more grown-up, sophisticated house he'd long dreamed of. “Having a spacious master bath with storage and a great big bathtub was more important than having a big bedroom,” Bob says, “so we turned the old master bedroom into the bath.” The result is a clean-lined closet and blissful bath that are equal parts practicality and luxury. Floor-to-ceiling cabinets with glass panels lined in shirred linen offer a plentitude of storage in the bath. A jaw-dropping, supersized tub enveloped in marble enigmatically “floats” atop the matching marble floor. The white cabinets and tub surround are set off by walls painted Benjamin Moore “Palladian Blue.” The black chest and the chandelier are from Mitchell Gold + Bob Williams. Designer Gail Plechary bathed the interiors of this Chicago-area home in a mostly white palette that is clean, calming, and sophisticated. In the master suite, a vaulted ceiling soars overhead. 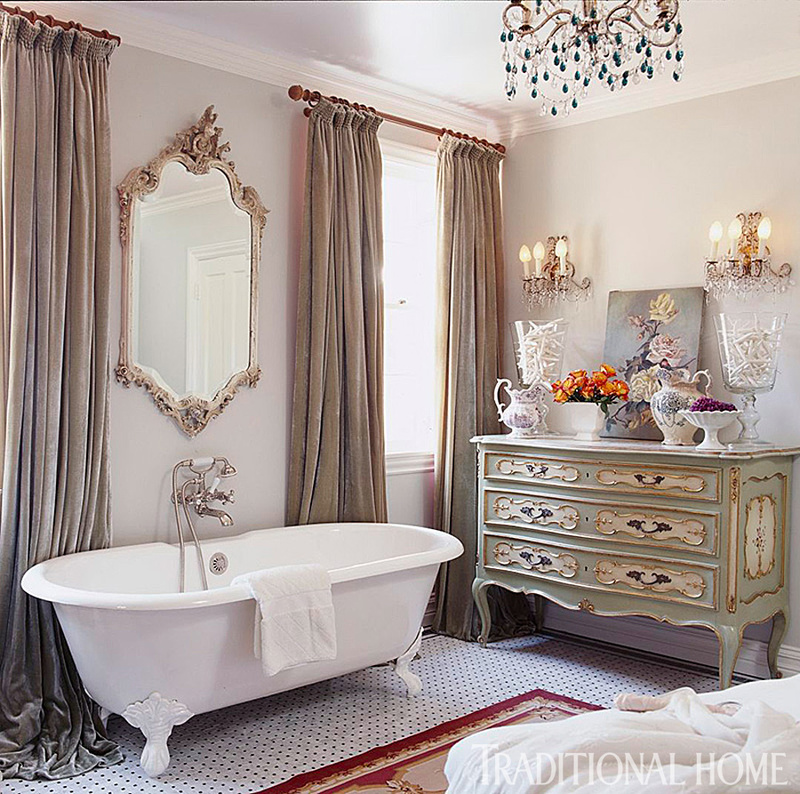 The bathroom is painted soft gray, with silk window panels, a crystal chandelier, and a framed charcoal drawing giving the space subtle opulence. 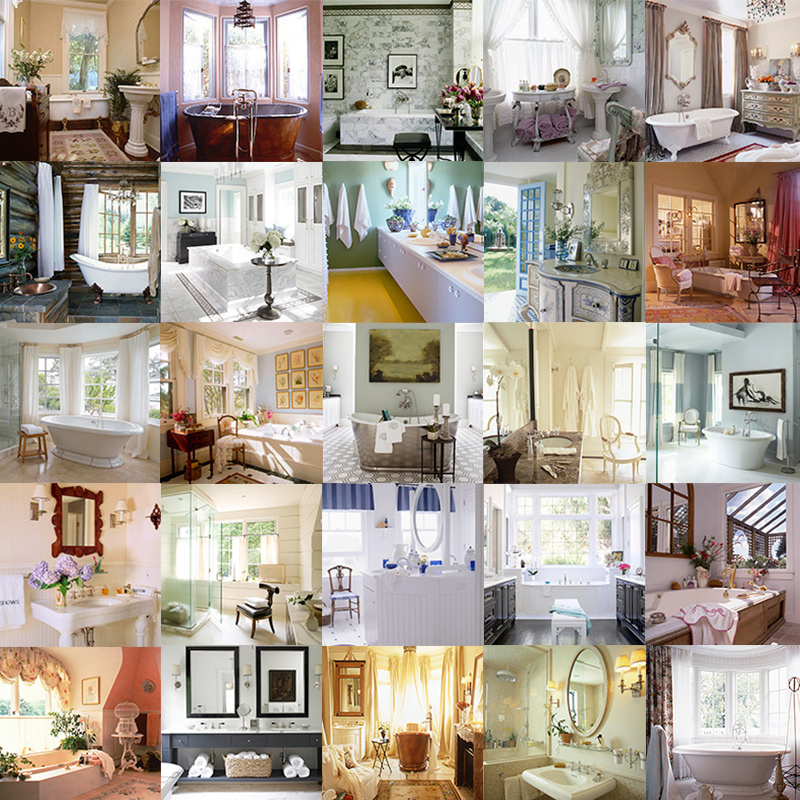 In 2013, Traditional Home, many local and national business, and 17 alumni of O’More College of Design created a remarkable showhouse. The 4,500-square-foot Shingle-style cottage was built just a short walking distance form the college's administration offices in Franklin, Tennessee. 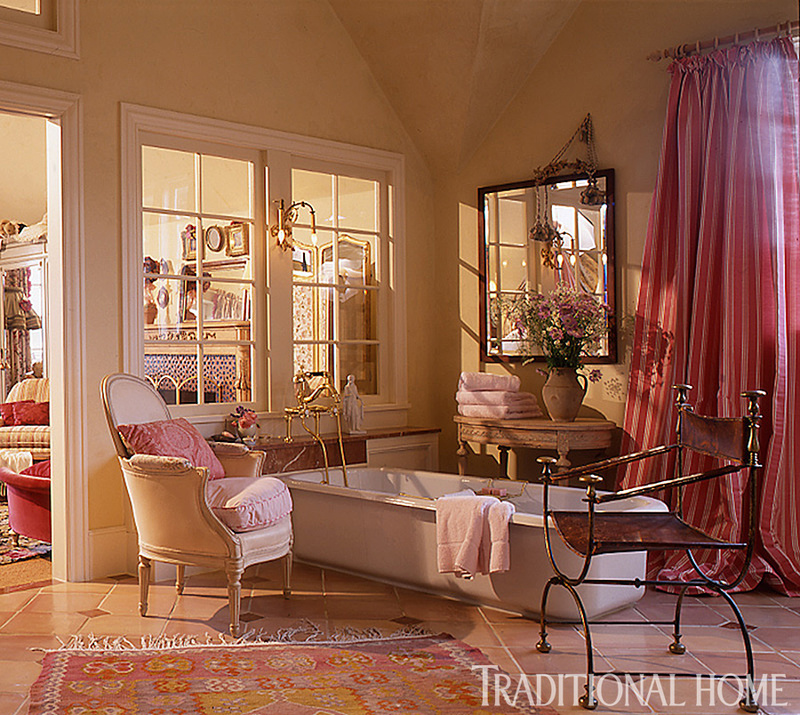 Dialing down the volume of the day was the aim for Kathleen Evers when she designed the master suite. “I wanted restful colors to emphasize that this is a place to relax,” she says. 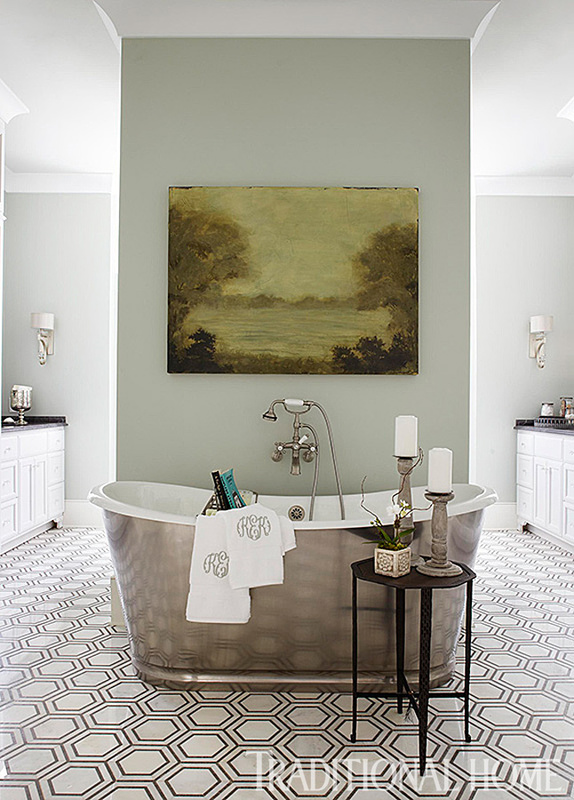 “Soothing aqua and cream, together with warm charcoal accents, appeal to both the masculine and the feminine.” French doors link the bedroom and bathroom, where a stunning presentation of the focal-point nickel tub on glimmering hexagonal floor tiles turns the glam factor full on. The bathroom floor plan divides the room in half, with dual vanities and dressing areas separated by a walk-in shower that can be entered from either side. Click here to tour the whole showhouse. Click here to get inspired by 19 beautifully organized closets and dressing rooms.